Dynaudio Xeo 3 review | What Hi-Fi? The Dynaudio Xeo 3 active wireless standmounters made their UK debut at the recent Bristol Sound and Vision Show 2012. Dynaudio has incorporated a distinctive take on wireless operation to its existing high-end loudspeaker engineering to create a system that can deliver high-quality music over a wireless network. So, how does it work? The Xeo 3 standmounters come with a sleek transmitter box that accepts wired music from an analogue or digital source and transmits it wirelessly to the speakers. They have their own power amplifiers (50W for each driver) and digital signal processing (DSP) handling crossover duties, all of which negates the need for external amps and DACs, while of course that wirelss connection means there's no need for dangling cables. We think the Xeo 3s look great – they’re compact and stylishly finished in black or white high-gloss lacquer. Inside each 6.4kg cabinet sit a 27mm soft-dome tweeter and 14.5cm mid/bass driver made from Dynaudio’s propriety MSP (magnesium silicate polymer) cone, and together they cover a claimed frequency response of 48Hz to 22kHz. The set up is versatile, allowing for a multi-source and multi-room system. You can connect the transmitter (below) up to three sources: analogue (RCA and 3.5mm minijack), digital optical, and USB. These let you stream music from CD/DVD players, iPods and MP3 players, and computers/laptops. The system supports files up to 24bit/48kHz and sends audio at 16bit/48kHz (which will cover all CDs). You can also add three pairs of Xeo speakers for a potential three-room system, with just one transmitter doing all the work. 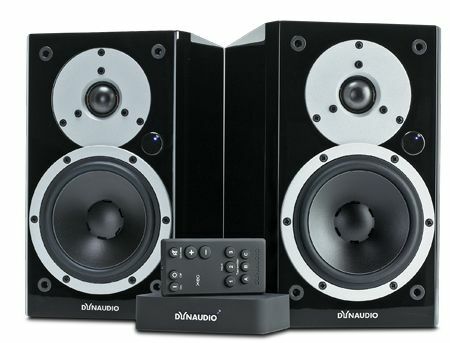 This is reflected in the pricing: a pair of Xeo 3 speakers with the transmitter set costs £1365, while an additional pair of speakers minus the transmitter costs a reduced £1180. The Xeo 3s are a breeze to set up using the minimalist yet functional remote control, which lets you allocate input sources and zones for each speaker pair, as well as controlling the volume. The sound quality of the Xeo 3s is impressive. They have heaps of rhythm and go loud with ease, while conveying decent detail and good timing. Spin The Dandy Warhols’ Bohemian Like You, and the Xeo 3s are nimble while delivering punch and attack with clear vocals., while a classical piece by Bach is handled with care and a considerable amount of finesse. True, by the standards of conventional wired speaker/amp combinations there could be a touch more precision and refinement, but for a wireless system, the Xeo 3s are a highly capable and enjoyable listen. We’d recommend streaming high-resolution music like WAV files through these speakers, as the shortcomings of a low-res compressed file streamed from an iPhone were very apparent. When it comes to positioning, you can keep them close to the wall and the bass stays controlled. The Xeo 3s are the best wireless speakers we’ve heard, and Dynaudio has done a stellar job in delivering sound broadly comparable to a similarly-priced wired system.